Another cold and frosty morning on the mountain and ignoring the dishes, the sweeping and the piles of laundry we headed off for a walk. Pass the ruined cottage and it's resident sheep. Taking a closer look at the grass and bracken, coated in frost. 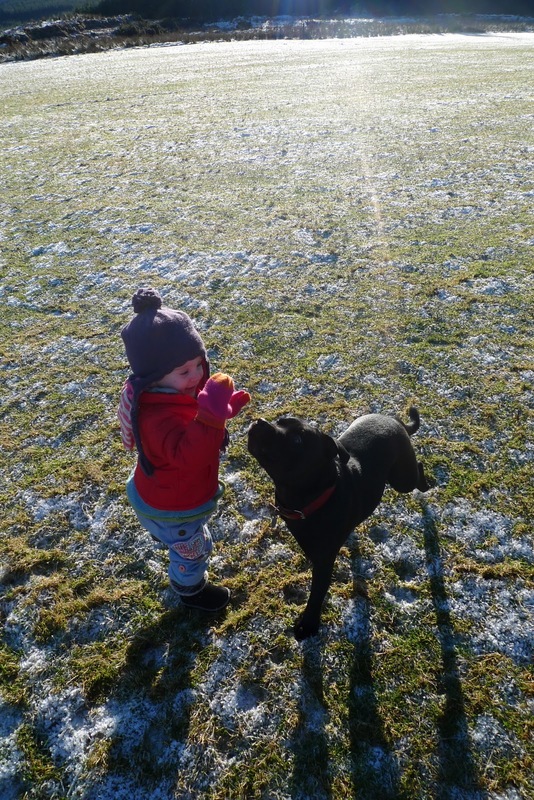 Then having a quick game of 'throw the ball' with Murphy. These two are firm friends! When suddenly a small herd of deer appear on the hillside. 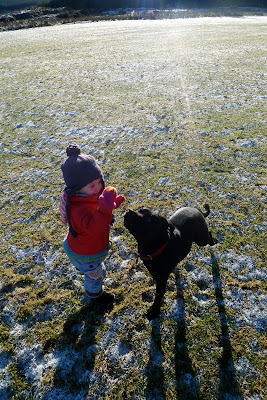 They didn't stay long, one noisy toddler and an excited doggie made them wary. They called out their warning call, which is a bit like a high pitched shriek, a couple of times then vanished into the thick forest behind them. The photo is magnified a lot, they were quite far away but it was thrilling to see them as it always is. There's a good photo and some information on sika deer here. Home again, past the sheep, having their morning gossip. Into the house and the warmth and the waiting breakfast things, looking forward to our next trip out. Bridget, your blog is brilliant and the photos beautiful. I didn't know you were a poet...and a knitter! Hi Marie-France! Am a learner knitter and accidental poet but thank you anyway! Thanks BB! WE live in a pretty beautiful place so photo ops are aplenty. Wow, those are great photos! You live in such a beautiful area! This looks like a delightful morning. Is the photo in your blog header your home? The area looks so beautiful! Thank you perches! The header photo is of an old ruined cottage next door to my house. That morning we were surrounded by cloud and all the cobwebs were magnified by dew drops. All of a sudden the sun came out but the cloud still surrounded us. It was like nothing I had ever seen before. Light everywhere but low cloud shrouding us. I was literally running around taking photos!